Beautifully maintained, with lots of facilities and an active Friends Group, Stanley Park is a green space for everyone to enjoy. 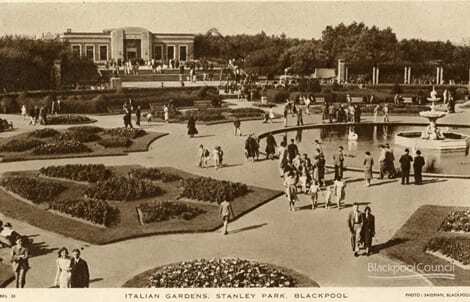 Stanley Park is Blackpool’s best known park. It’s about 1.5 miles inland from Blackpool seafront, near to Blackpool Zoo and the Victoria Hospital in the Layton/Marton area of town. Stanley Park is also the largest park in town. It’s perimeter is a length of 2.2 miles (3.54 km) and it covers an area of 256 acres (104 ha). Enter the park through the main gates, travelling along Mawson Drive. Arrive first at the Visitor Centre, which was opened on 24 August 2005 by the 19th Earl of Derby. 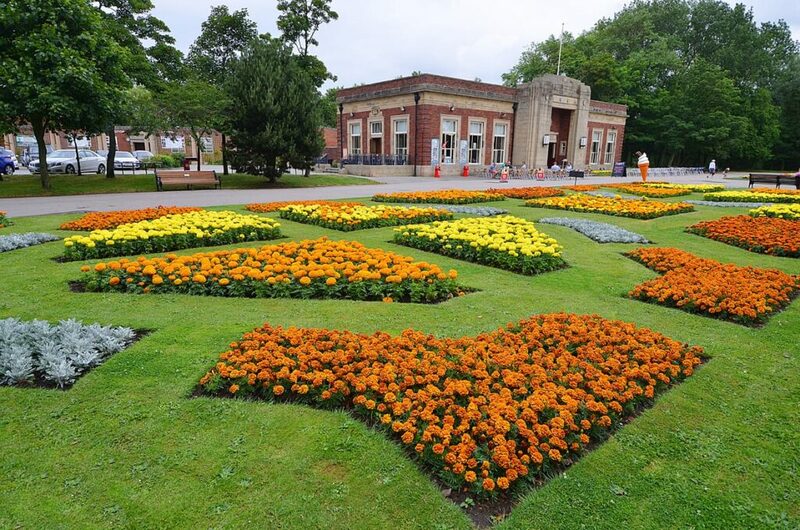 Next to the Visitor Centre is the art deco cafe – both buildings are surrounded by rose beds and ornamental gardens. The art deco cafe is worth a visit in its own right. It’s a beautiful period building which has been renovated to its original glory. The Visitor Centre is where you’ll find the Friends of Stanley Park. 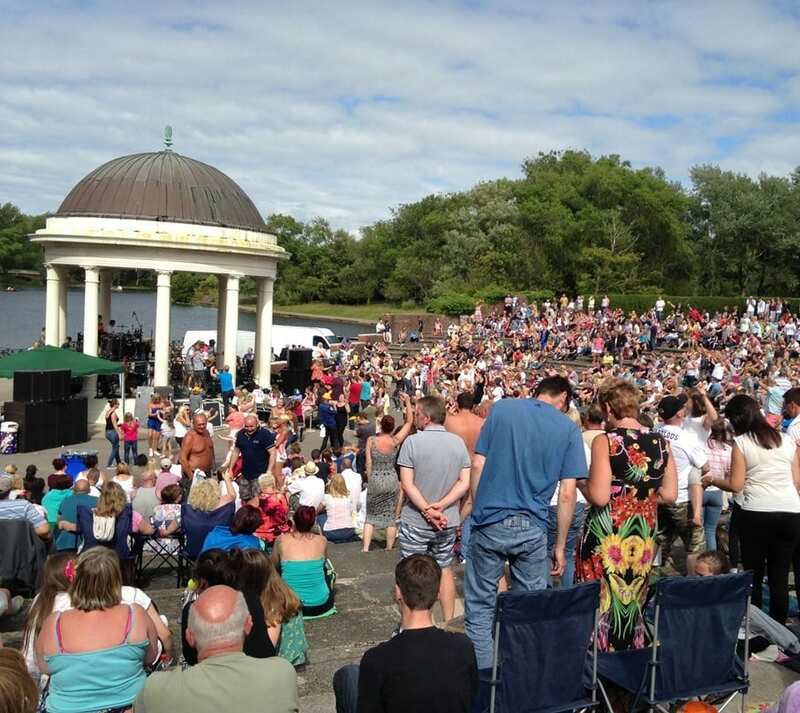 Their help makes an amazing difference as they raise money towards its upkeep, and organise the free events on the bandstand each summer. The design of Stanley Park radiates from the circular Italian garden at the centre, and right in the centre of the garden is a fountain surrounded by flower beds. 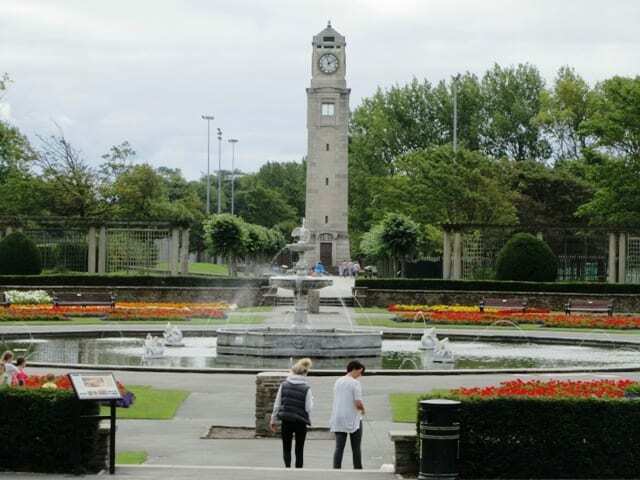 The Clock Tower, a memorial to Blackpool’s first Mayor, Dr William Cocker, is to the south of the central fountain. It’s sometimes open during special events like Heritage Open Days, for you to climb to the top and enjoy the view. Steps down to the garden are protected by two copies of the original Medici lions. At the eastern side of the park is the large boating lake (beyond it the Zoo is across the road). It can be used for boating and fishing in designated areas – charges and memberships for fishing are available from/payable at the boathouse. The lake is home to large numbers of water birds, ducks, geese and swans – especially since they have their own island in the centre. 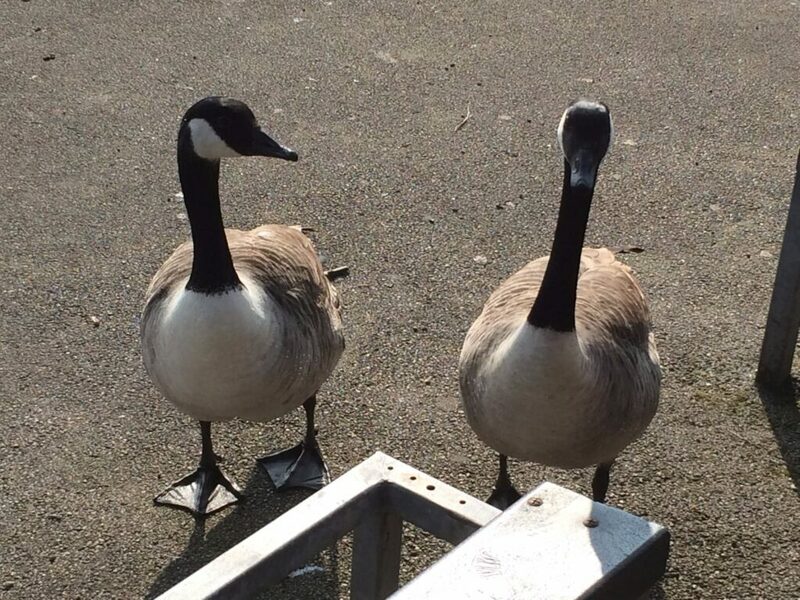 If you love to feed the birds, please don’t take bread for them. It’s the avian equivalent of junk food, no good for the pond water, can attract vermin and spread disease. Instead, take along frozen peas or corn, lettuce, grapes or chopped green veg, oats, rice (raw or cooked) or bird corn/seed. The trees are also home to a large heronry – with big floppy nests built high in the trees by these magnificent birds. Watch out if you live nearby and you’ve got a fish pond. You can bet that they’ll come to visit your garden – and steal your fish! 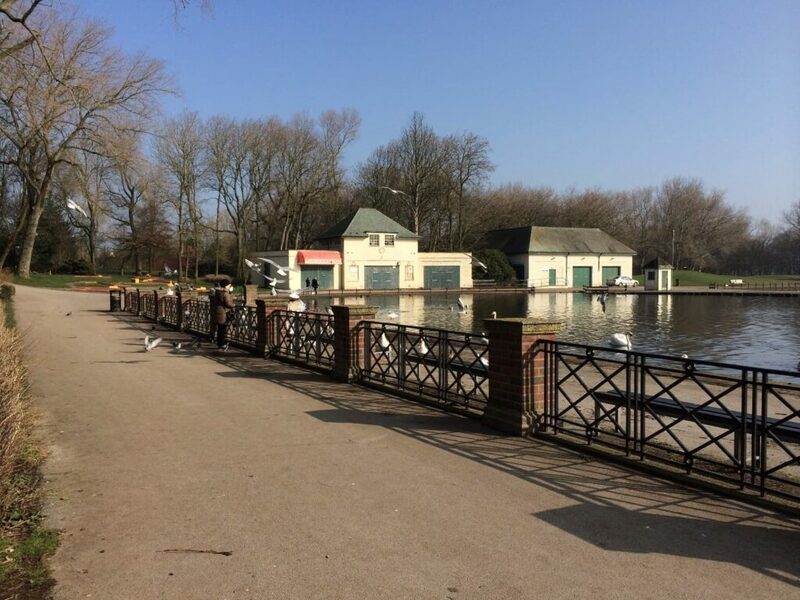 Stanley Park is a lovely park to enjoy, with plenty of things to see and do do. The sports facilities are very good too. play facilities for children of all ages. The 18 hole Stanley Park Golf Course was designed by famous architects Harry Shapland Holt and Dr Alastair Mackenzie. The western side of Stanley Park is where you’ll find the 5000-seater cricket ground, home to Blackpool Cricket Club. It’s also regularly used for county cricket by Lancashire CCC. Stanley Park Sports Arena (which hosts a number of athletics competitions) and Blackpool Sports Centre (with three halls, gym and climbing wall) are at the south of the cricket ground. This area also contains a putting green, table tennis tables and a conservatory. Did you know? That Blackpool F.C. had its home at the athletic grounds on the same site between 1897 and 1899. That was before they moved to their well known home on Bloomfield Road. 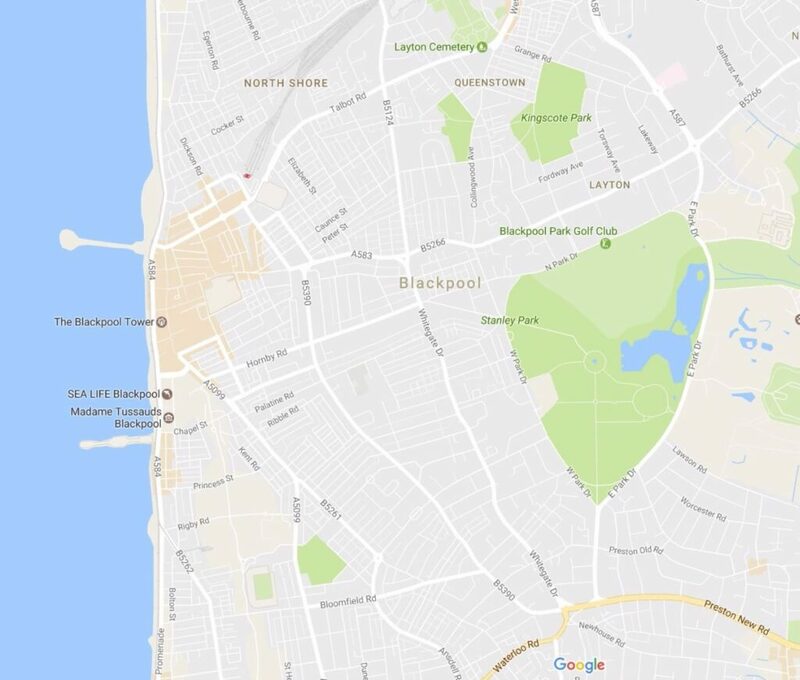 The southern side of Stanley Park is dominated by playing fields but is also where you’ll find a children’s play area and Blackpool Model Village. The Model Village has its own entrance, but it’s enclosed within the park perimeter. 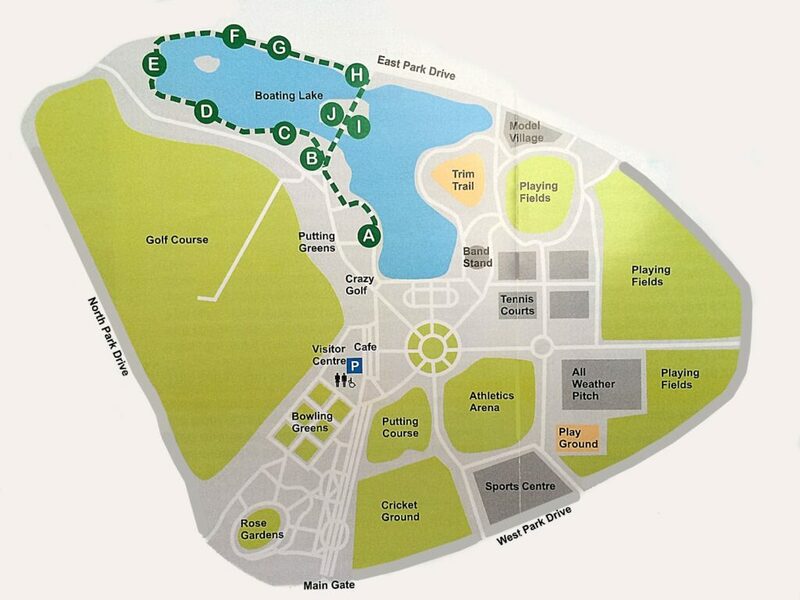 Tennis courts, astro-Turf pitches and a skateboard park are also in the southern part of the park. 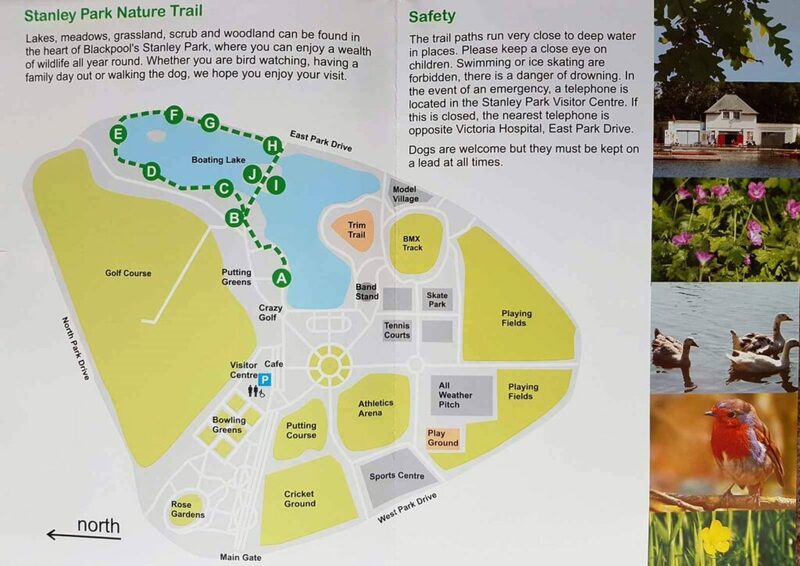 Stanley Park Nature Trail is a circular walk from the Visitor Centre round the edge of the boating lake through the dedicated conservation area. Follow the markers from A-J on the green dotted route in this map. Stanley Park Nature Trail can be enjoyed during park opening hours which are dawn to dusk each day. There are toilet facilities next to the car park. Many areas of the park are suitable for disabled visitors. At a leisurely pace it will take you about an hour. Leave the Visitor Centre, turn left past the cafe and head down the path to the lake with the boathouse on your left hand side. Organised group and school visits are welcome throughout the year. The Friends of Stanley Park and the Parks Department can organise heritage and environmental activities for all ages and abilities. Please contact the Visitor Centre for more information and to book. Tel 01253 699470 – and please mention that you saw it on Visit Fylde Coast! Be careful: the path runs very close to deep water. Please keep a close eye on children and dogs. Swimming and ice skating are forbidden. Dogs are welcome but must be kept on a lead at all times – and please don’t let them chase the birds. Marker A: The start of your route where the park becomes more natural and the lake is on your right. You’ll see huge numbers of water birds here throughout the year. Many of them live on the islands in the lake including Moor Hens, Mallard Ducks, Coots, Mute Swans and the Great Crested Grebe. Canada Geese and Greylag Geese graze on the grasslands around the lake. Marker B: You’re now on the edge of the woodland area which runs round the east side of the lake. Follow the left fork of the footpath to see native tree species including Cherry and Silver Birch with it’s aptly named pale grey bark. There are lots of Common Oak trees, did you know they can live up to 1000 years? Oak trees support more wildlife than any other tree with over 300 species of birds, mammals and creatures depending on them for food and shelter. Continue down the footpath to cross a small bridge over a ditch – which attracts lots of different dragonflies such as the brightly coloured Emperor. Marker C: Going deeper into the woodland you’ll notice typical British birds like Blackbirds, Chaffinch, Song Thrushes and Wood Pigeons. If you’re lucky you might see a Great Spotted Woodpecker. They climb the tree trunks, tapping them as they look for food. Marker D: Visiting this area at dawn or dusk you might see foxes, stoats, weasels or wood mice. 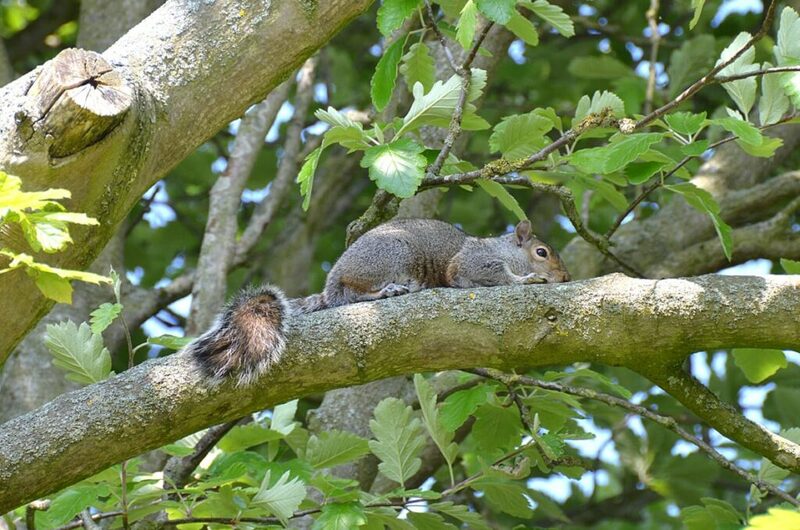 Grey squirrels are the most common mammal in the park. There are also bat boxes fastened to trees in this area of the woodland. In the early evening you may see Pipistrelle bats leaving these boxes to hunt for food. Marker E: Look from here towards the north of Stanley Park Lake to see a wooded island with a large colony of Grey Herons, called a Heronry. The Heron is a large, beautiful bird with long yellow legs and a long beak. They build their big nests high in the trees. They can be up to 3 feet across – the ones which are occupied have droppings on the ground underneath. The same birds use their same nest each year, unless it is blown down by high winds. You’ll also see lots of Black Headed Gulls, who like to perch on the old fence across the lake in front of the island. Marker F: Keep an eye out for butterflies, they feed and lay eggs in the long grass, nettles, shrubs and trees. Between March and September you might find Small Tortoiseshell, Peacock, Speckled Wood and Red Admiral. You might also see dragonflies around the edge of the water, including Brown Common Hawker, Migrant Hawker and Emperor. Marker G: Along this path you’ll see lots of wildflowers including Cow Parsley, Red Campion, Hedge Garlic, Cleavers, Meadow Buttercup and Honesty. Bluebells grow here in Spring. Marker H: The viewing platform near the gate gives you a chance to see the birds on the lake from close quarters. Many of them are tame and will come and visit you on the chance of a snack! Marker I: The ornamental bridges are some of Stanley Parks many attractive features. They give you a fantastic view of both sides of the lake and the woodland areas. Turn left off the bridge and walk to marker I for a panoramic view of the lake and bandstand. Marker J: The picnic area was created by volunteers as a space for you to sit and enjoy the view. The Hawthorn shrubs in this spot attract lots of insects and birds so you should be able to see lots of them close up. 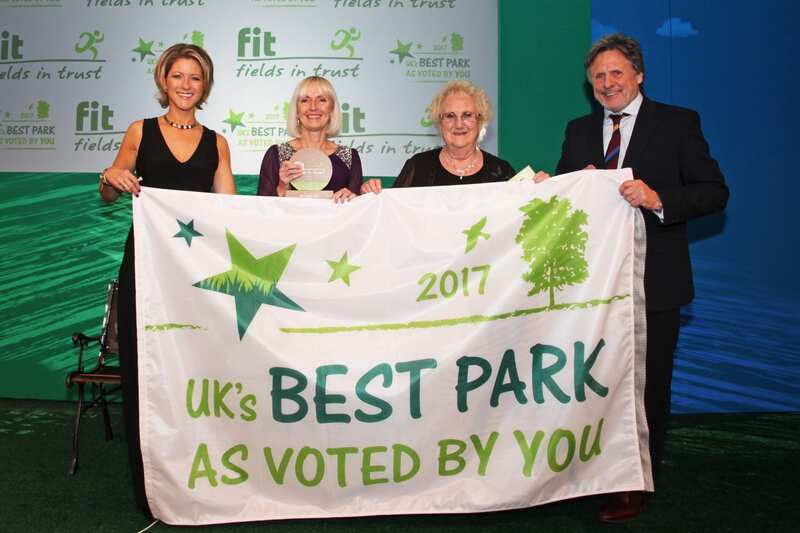 Stanley Park has been voted by the public as the UK’s Best Park at the prestigious annual Fields in Trust Awards 2017. Left to right: Awards host, TV sports broadcaster Jacqui Oatley MBE; Diane Farley, Parks Operational Manager at Blackpool Council; Elaine Smith MBE, Friends of Stanley Park and Brynmor Williams, former Welsh Rugby International and Fields in Trust Trustee. The public nominated 360 parks in total from across the UK, with over 15,000 votes cast and Stanley Park beat off stiff competition from the three other finalists. 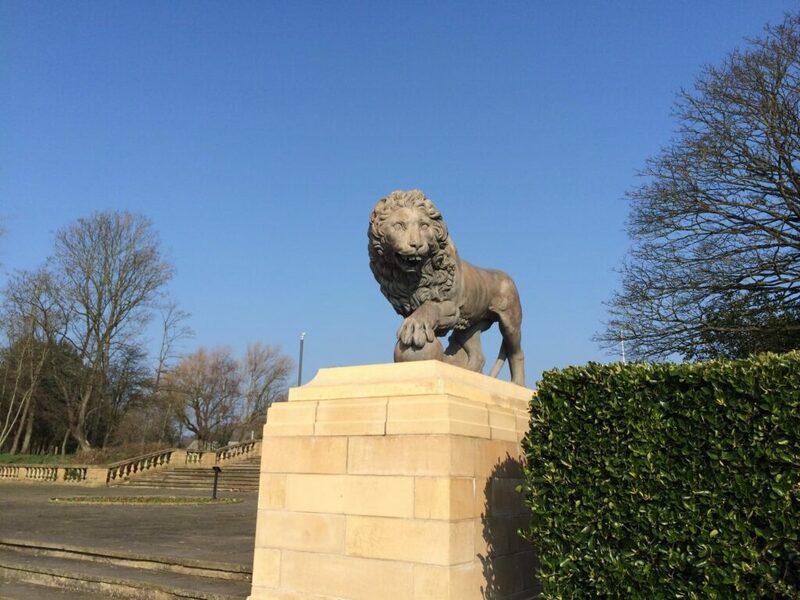 Designed by celebrated landscape architect Thomas Mawson in the 1920s, Stanley Park boasts an Italian marble fountain, boating lake, bandstand, Medici lions, Italian gardens and Art Deco styled café. It scooped the headline award at the annual Fields in Trust Awards 2017. 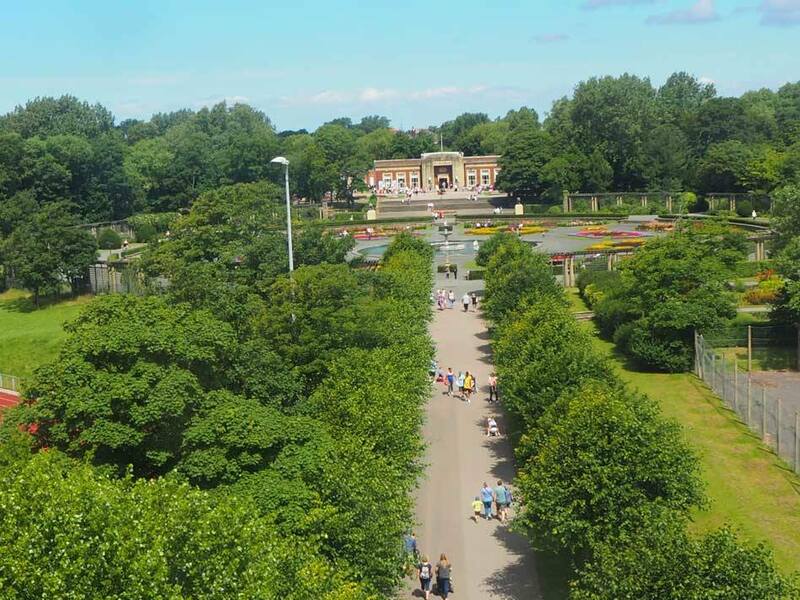 Stanley Park is the jewel in Blackpool’s crown, with a variety of attractions including a wonderful café, scenic walks, beautiful gardens and sporting activities. 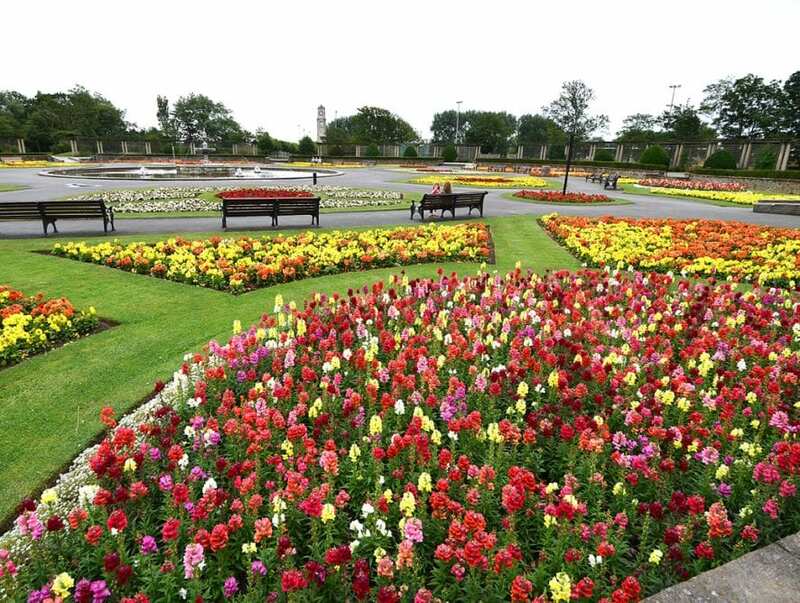 Dedicated Blackpool Council staff, along with partners such as the Friends of Stanley Park and volunteer groups, work hard through all seasons to keep the park’s standards high. Stanley Park is a sensational events destination and often hosts music festivals, concerts, sporting events, corporate conferences, art fairs and numerous individual meetings and company events. Reservations – To make an enquiry about hiring park space along with details on hire costs please contact the Parks and Open Spaces Service directly. Ring 01253 478358 or email parks@blackpool.gov.uk Please mention that you saw it on Visit Fylde Coast! 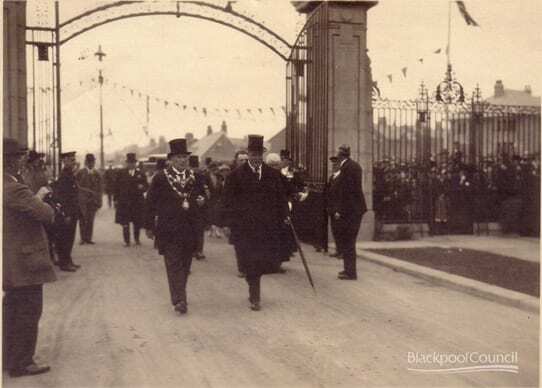 In 1921 the former Mayor of Blackpool and Member of Parliament Sir Albert Lindsay Parkinson acquired an area of land. 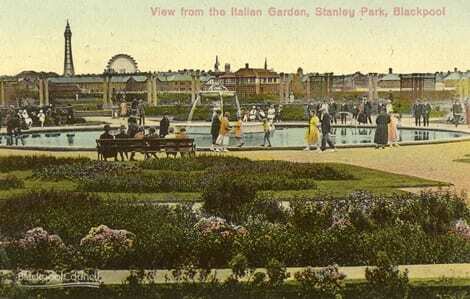 His intention was to develop it into a park for Blackpool with the help of the town council. The council later took over the land and the project, going on to develop more buildings and acquire more land. Distinguished landscape architects of the time, TH Mawson and Sons, had the job of designing the park – and a good job they made of it too! 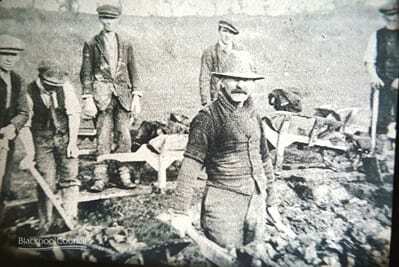 The ‘son’, Edward Mawson handled most of the work as his father’s health failed. The park’s golf course was designed by the famous partnership of Harry Colt and Dr Alister MacKenzie, who also created the nearby Blackpool North Shore and Royal Lytham and St. Annes courses. 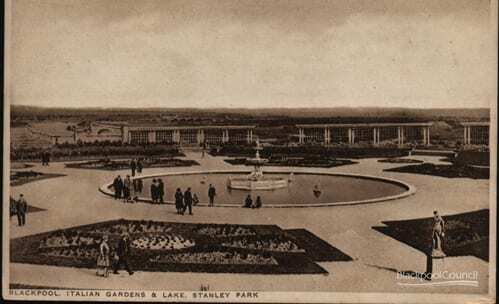 On 2 October 1926 the park was completed and declared open by the 17th Earl of Derby, Sir George Edward Villiers Stanley. 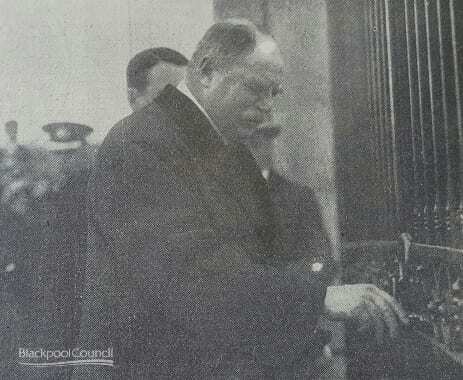 It’s named in honour of his father, the former Governor General of Canada, Frederick Stanley, 16th Earl of Derby KG, GCB, GCVO, PC who, from 1885 to 1886, had been the first MP for the newly created Blackpool Parliamentary Constituency. For 20 years before that he had also been one of the MPs for the larger constituency of which Blackpool was then a part. As a historically important garden, Stanley Park has had Grade II status since 1995 on the National Register of Historic Parks and Gardens. 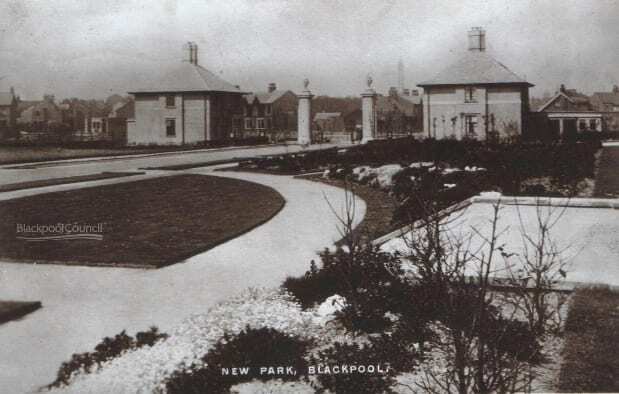 Despite its age, the park was still the most recent park development in Blackpool until 2006 when George Bancroft Park was opened – where the climbing towers are on the approach into Blackpool near to the Football Club. 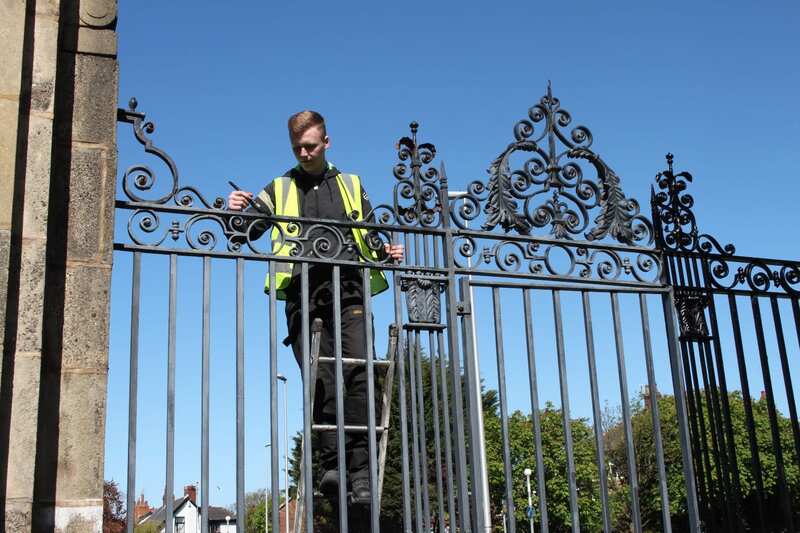 Stanley Park’s ornate main gates on West Park Drive have been returned to their former glory as their intricate decorative features have been repainted in gold. The impressive gates were opened by the 17th Early of Derby on the 2nd October 1926 with a golden key used in the lock. The Mayor Thomas Bickerstaff and 80 other Mayors and Mayoresses joined local and national dignitaries to mark the occasion. Elaine Smith, Chairperson of the Friends of Stanley Park which has funded the project, said: “We continually strive to raise funds through events and activities in Stanley Park to generate much needed funds to support the Parks Department in the maintenance of our Grade 2 Heritage Park. Stanley Park celebrates its 90th summer! To mark the occasion the official opening ceremony of 1926 was recreated. 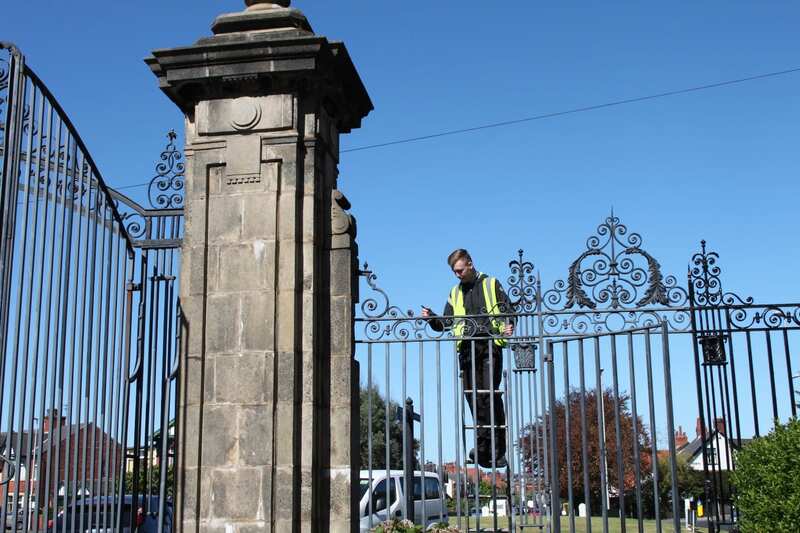 Edward Stanley, the 19th Earl of Derby unlocked the ornate main gates on West Park Drive, wearing morning coat and using a golden key – just as his grandfather did 90 years earlier. 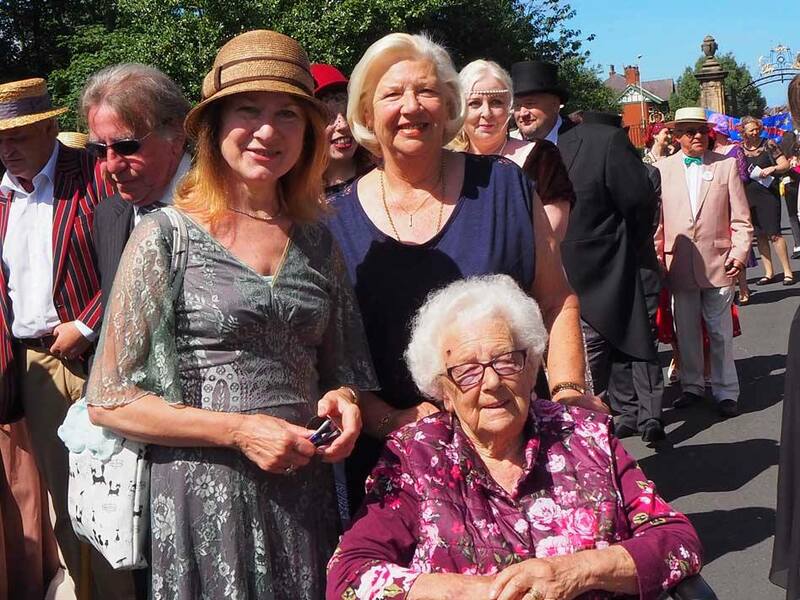 Among the specially invited guests was 95-year-old Edith Wilkinson who attended the first ceremony 90 summers ago. Edith remembers that she and her brother Fred had their photograph taken with the 17th Earl of Derby, who originally opened the park. (Above) Joan Humble and Jean Sanderson from Blackpool Civic Trust with Edith Wilkinson who is also a member of Blackpool Civic Trust. Edith was 5yrs old when she attended the original opening of the park over 90 years ago. She also still attends meetings of Blackpool Civic Trust. 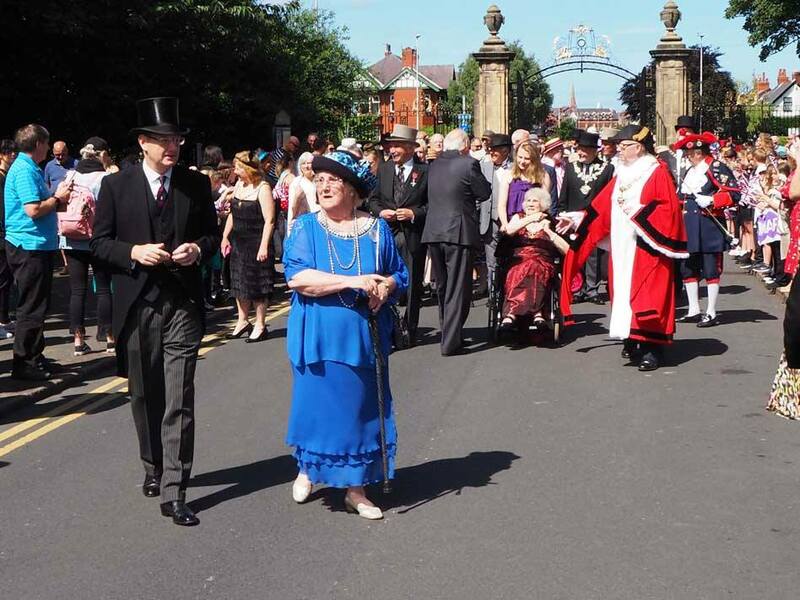 The Earl was joined by schools from across the town, dressed to represent different decades. 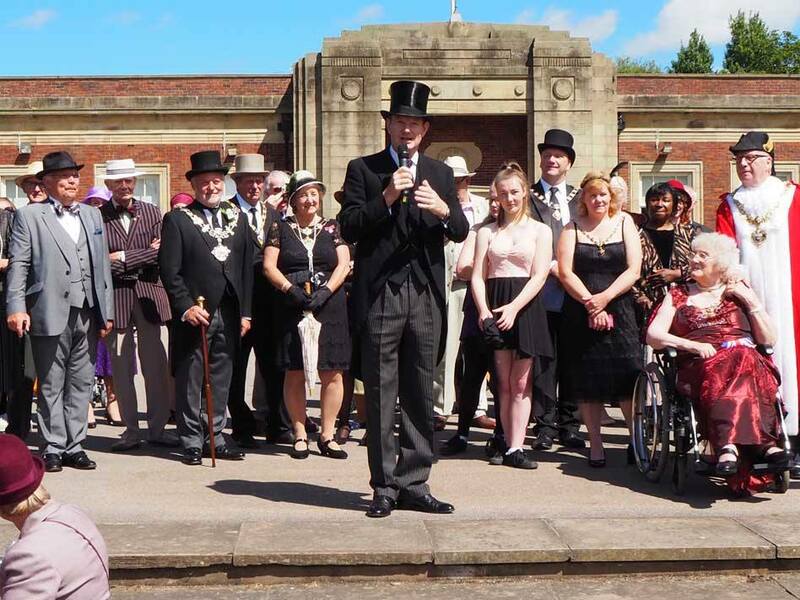 After speeches from the Earl and The Mayor of Blackpool on the café terrace steps, the official party progressed up Mawson Drive. The children then performed songs and dances at the bandstand. Park goers joined traditional games such as croquet, hopscotch, hula hoop as well as bounce on space hoppers. Throughout the park, staff, volunteers, dignitaries and children were dressed in period costume. Ladies were taking a walk in 1920s dresses, newspaper boys in caps, gentleman in blazers, boaters, top hat and tails. School children appeared as Blackpool’s 1953 FA Cup winning football team, cheered on by their supporters. A new audio visual recording which has been produced by Bev Carroll a Friend of Stanley Park was played later in the day. 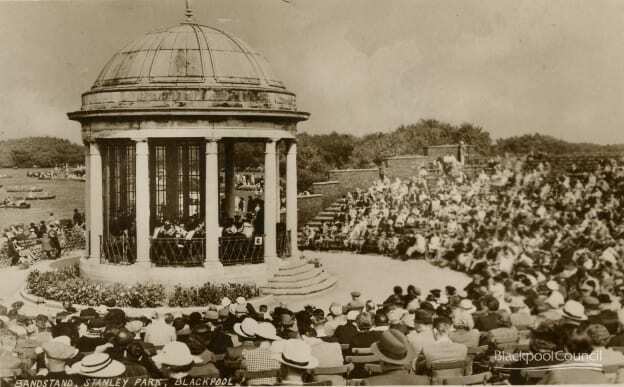 Through a mix of voiceovers and images it captures people’s experiences of the park over the years; recording the memories of those that were at the original opening in the twenties including 95-year-old Edith Wilkinson and 101-year-old William ‘Arnold’ Darbyshire who saw the park being constructed.